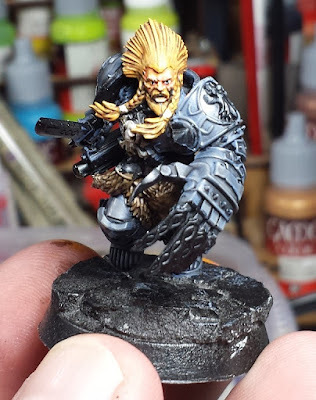 Mordian 7th Regiment: Heresy Era Space Wolves - Geigor Fellhand painting begins! Heresy Era Space Wolves - Geigor Fellhand painting begins! Another quick hit today - Not a whole lot of contiguous brush time since the last update, but I did manage to sneak in an hour here and there and made a little progress on Geigor Fellhand from the new Prospero box. After knocking out 40-some odd 'Stealers, and with another 100+ staring at me from the painting shelf I did feel it was time for a quick break to recharge the hobby mojo before tackling the next batch of gribblies. Laid in the basic greys and then started in on the marathon of detailing, leading off with the various wolf pelts (which I realize are more or less completely obscured in this pic), his face and of course his ridiculous hair. Actually rather pleased with how he's coming along so far, this may be one of the best faces I've managed, but as an avowed Thousand Sons guy I have to chuckle at the irony that it's on a Space Wolf! His face really is quite lovely. That perspective really sells the model. Crack on. Great face and hair. Must use A ton of hairspray! VEry goo start - think I need that box, so many cool models. Now to punch his face off with some psychic might! It looks well done though. Are you planning on getting the custodes grav tank and all? I wish I had that hair. The closest I get these days is a furry hat in the winter. You are a beast dude, I can't believe how much you paint and to such a high standard. He looks awesome so far! Good start mate - I like the grey recipe you've gone with so far. @Frothing Muppet: Thanks man! Have been reading up on better photography techniques, hopefully the pics will continue to improve! @DaveTaylor: Haha! Thanks very much, bud! @Siph_Horridus: Indeed! Their assault on the ozone layer via astartes CFC-based hairspray is all part of the battle plan! @Rory Priest: Hah! You know it - I plan on attempting to do a battle scene between the two with the second box set's as-yet-unbuilt characters with Geigor getting zorched! @Zzzzzz: You and me both, my man! Glad you're digging him so far! @#2501: For sure! I knew there was something dodgy about the wolves, their hairstyle secrets are drawn from the filthy Xenos! @Dai: Haha! I can't even begin to count the number of one-off models on the "Someday Shelf" too! The eyes really give him a great intensity. I'm not usually a fan of picking the eyes out like that, but it really pulls the whole thing together in this case.